Teen anger can take many forms. You might see it expressed as resentment, rage, or even fury. The anger that teens struggle with is very intense and powerful feeling. Anger is a secondary emotion for teens because it covers up other feelings that they find difficult to express. 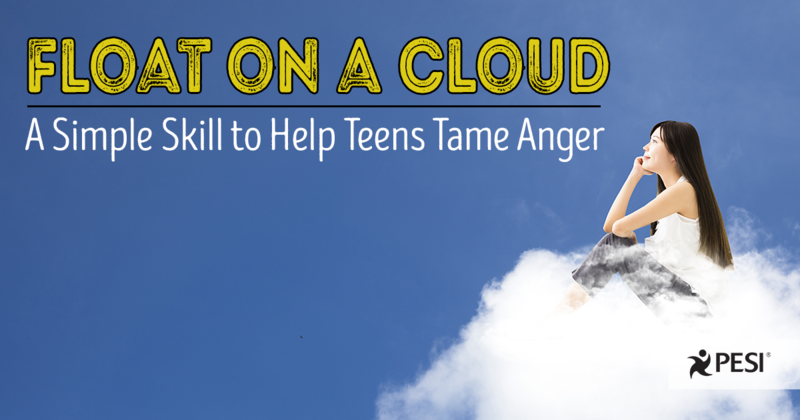 Float on a Cloud is a popular and highly effective tool to manage not only a teen's anger, but also those underlying, super-strong feelings felt immediately before anger such as: frustration, fear, hurt, failure, humiliation, shame, sadness, rejection, distrust, jealousy, inadequacy, and insecurity. When teens learn to let go of anger, even briefly, they feel calmer and more empowered in a healthy way. Letting go of frustration and anger also paves the way for problem solving. For example, Float on a Cloud could help a teen explore how to allow more time get to school during morning madness, or how to get school work done better. Managing anger for teens also helps them to manage relationships with family members, peers, and teachers. 1. Find a comfortable place to sit, recline or lie down. 2. Close your eyes if you are comfortable doing so and imagine floating on a soft, white, puffy cloud. 3 Breathe in picturing yourself floating up a few inches. 4 As you breathe out, imagine yourself floating back down and your anger leaving your body and going through the cloud into the surrounding air. Float on a Cloud is just one of 54 unique cards from my new card deck "Letting Go of Anger." The easy to use exercises are simple skills and tools to help manage anger, overcome anxiety and create positive changes. Download the Float on a Cloud card now and find the full "Letting Go of Anger" card deck here.